SIRANE has won a Green Apple Environment Award in the international campaign to find the greenest companies, councils and communities. Finalists will be presented with trophies and certificates at a glittering ceremony at the House of Parliament on November 12 – where Sirane will discover the level of the award, having already battled against 500 nominations. The company has won the award for Environmental Best Practice – largely for its work on the Earthpouch – a plastic-free packaging pouch solution. Simon Balderson, Sirane MD, said: “The Earthpouch is a fabulous product, and it’s great that the judges at the Green Apple Environment Awards have recognised this, and the work that’s gone in to developing the product. “Sirane’s constantly innovating, and the environment is at the forefront of a lot of our thinking. Plastics – and perhaps more specifically removing plastics where possible – is the hot-topic, and it’s great that Sirane is able to offer this product. As a result of the award, Sirane will be included in The Green Book – the leading international work of reference on environmental best practice – and may also be chosen to represent the UK in the Green World Awards 2019 and have 100 trees planted in our name as part of the UN Billion Trees Initiative. The Green Apple Awards are organised by The Green Organisation – an international, independent, non-political, non-profit environmental group dedicated to recognising, rewarding and promoting environmental best practice. Sirane’s Earthpouch – developed in conjunction with B&G Products – was a couple of years in development, and Troofoods launched in the new year. Sirane acquired B&G Products earlier this year, and it is now part of the Sirane Group. We now have a number of customers, including overseas – McCambridge in Ireland was the first overseas customer, who used it for their gluten-free porridge, and we’ve also had orders from a handful of European countries, the US and South Africa. The Earthpouch – an industry first – is made from a paper with a 100% plastic free heat-sealable coating which is then formed into a preformed stand-up pouch which provides total food security for dry and moist food products. 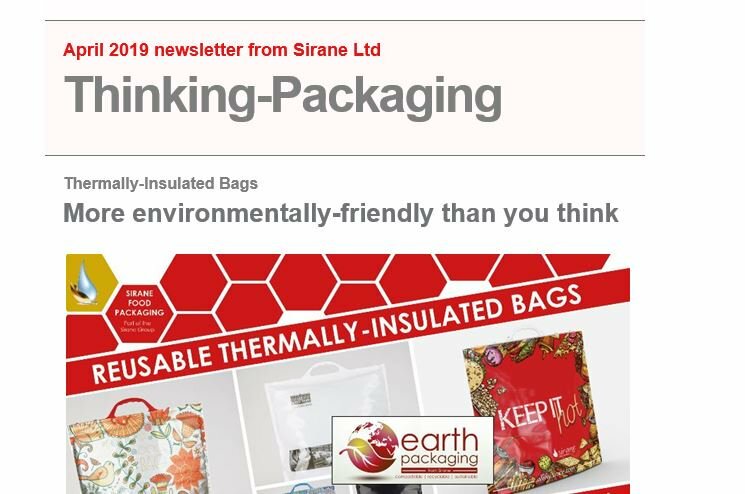 Simon Balderson, Sirane MD, added: “We presented the Earthpouch at Packaging Innovations earlier this year at the NEC, Birmingham, and it provoked real excitement, we’ve had many inquiries - and orders - on the back of it. The Earthpouch is just one of a range of compostable/recyclable products and packaging solutions Sirane has developed over the years – and it has been placed in our Earth Packaging range: compostable; recyclable and sustainable. We’re already working on enhancing and expanding the Earthpouch range, including higher-barrier pouches, ovenable versions and more – the Earthpouch is not just a product, it’s the start of a range of plastic-free products. We’ve since added both bags and films to the range using the same ‘Earthpouch’ material, allowing customers to purchase the material in a form suitable for flow-wrap, and also as bags when a ‘stand-up’ element is not needed. The Green Apple Award isn’t the only industry recognition we’re received. Earthpouch has also been shortlisted for a prize at the UK Packaging Awards, with the winners being announced at a ceremony in London in October. The Earthpouch – a plastic-free packaging pouch which is both recyclable and compostable – is one of 10 finalists for the Resource Efficient Pack of the Year. Winners will be announced on October 30th at the Grosvenor House Hotel on Park Lane, at an awards ceremony organised by Packaging News. The Earthpouch was also recognised earlier this year at the Sustainable Food Awards in Amsterdam, where it finished third in the sustainable packaging category. Sirane is an innovative food packaging development-to-manufacture company, with expertise in absorbency and material science. Specialisms include bags and pouches, absorbent products, shelf-life extension and dual-ovenable products.